Can one of Austria's biggest clubs take back the crown from Red Bull? Matic: "We All Know How Big Austria Wien Is"
Rose: "Draw Shows Austria Wien Can Compete For Title"
Newcomer Uros Matic has already fully integrated into the first team at Austria Wien after only two weeks of training. "I like the way we are training and how Christopher Steegmann is wanting us to play and I love aggressive offense. I am convinced that we have the right players to successfully implement his system," says the 28-year-old midfielder during the first team’s training camp in Wiener Neustadt. Many new faces characterize the training ground with eight intensive days in Wiener Neustadt are also being used to bring together the team even closer. "We started working on becoming a team on day one. As you can already see well in our training sessions, we are on a very good path. The communication and the cohesion between all players is already excellent," says Matic. ”Our fans should be able to enjoy every game in the new stadium"
The fight for a place in the starting line-up, which will play their first game at the renovated Generali Arena against Hartberg, has already flared up, you can almost feel it on the sideline of the training ground. "Of course, we have very high expectations for the season – I think that every single player works for the team and wants to improve themselves during every training session," emphasizes our new number eight. All the players know how important the upcoming season is for Austria Wien, that the expectations and aspirations of the violet fan is always high. "We all know how big Austria Wien is, how many successes the club has celebrated in the past. During my two weeks as a ‘Violet’ so far I have only collected good impressions. Of course, the stadium is a big step for the club. With a good season, we want to ensure that our fans can enjoy every match in the new stadium," says the 28-year-old Serb. The training camp in Wiener Neustadt will most likely be the most intense part of pre-season. With two to three sessions a day, treatments from the club’s medical team and plenty of individual and group discussions, players and crew are in full swing all day: "Christopher Steegmann demands the absolute maximum from each player, so each can develop as a footballer and as a person. This is the only way to be successful", emphasizes Uros Matic. The conditions for a good preparation are great at the training ground in Wiener Neustadt and at the team hotel. "I have been in Wiener Neustadt several times before with other teams. The hotel, the training conditions and the weather are ideal – thus we have the best conditions for a good preparation and to be able to start well into the new season." Justice: Thanks for the follow man! 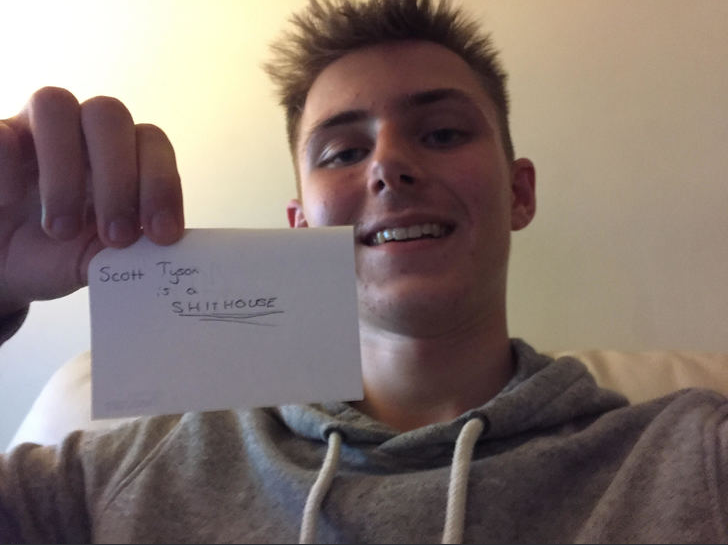 ScottT: I'm back!! Thanks man, glad to have you along for the ride! I've never seen a story in Austria, so this guarantees to be a unique and interesting ride. You could be in Nepal and I'd still be intrigued due to the quality of your writing though. Good to see things are starting to come to place. A tough training camp is what will be required for any top team with ambitions. I envisage a successful season for the team in violet! 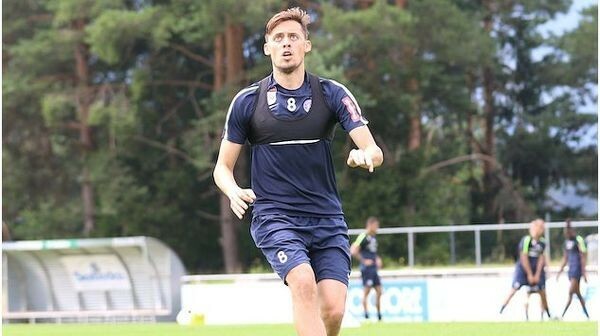 Austria Wien have completed the loan signing of 23-year-old left-back for a year and the club can confirm that they have the option to buy the full back permanently in the summer of 2019 should they so wish to. Cristian Cuevas, who was under contract with Chelsea FC as a youngster joins the ‘Violets’ from the Chilean first Primera liga club Huachipato FC. Meanwhile new manager Christopher Steegmann said he was delighted to have completed the signing of the left back, stating that in the Chilean, Austria Wien had signed an aggressive player with international experience but most importantly Cuevas was a positive guy and someone who would boost the team in the coming season both on and off the pitch. After making his debut in the Violet shirt of Austria Wien in the impressive 3-0 friendly win over Wigan Athletic during pre-season, Cuevas gave his inaugural interview with the club, going on to say; "I'm happy to sign with Austria Wien, the stadium looks great, I think players can be very happy with the training conditions here, we want to play a good season and qualify for the Europa League at the very least. I was able to see that we have good players who want to play football and we performed well against a good team from England." The Chilean was signed by Chelsea in 2013 at the age of 18, was lastly loaned to Twente Enschede, where he was a permanent member of the team in the highest Dutch league. In the years before Cuevas played amongst others in Belgium for VV St. Truiden and in Chile at Club Universidad de Chile. The former U20 team player celebrated his debut in the Chilean national team against Poland in June 2018. Justice: Yeah, the new training modules seem to have been helping and we’ve had some good results so far, so hopefully things are looking good for the new season. Interesting deal. Intrigued to see what role he plays in the upcoming season. I have a feeling we’ll be learning a lot of names and talent over the course of this story. 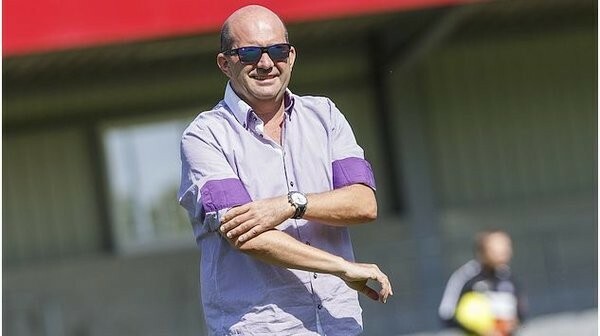 Technical Director Ralf Muhr spoke to fk-austria.at about the summer transfer window, his expectations for the new season, about the consistency between the academy, the Young Violets and the A-team, and the increasing professionalization of Austria Wien. What are your first experiences and impressions in your role as Technical Director of Austria Wien? Which individuals issues had to be improved in the A-team? The first major focus was, of course, the squad optimization of the A-team and the Young Violets. With the training start we also defined our goals. It is important to me that the spirit of optimism, which can be felt throughout the club, is also visible on the training ground and on the pitch. My work as Technical Director has been very intense and extremely demanding. For me personally, it was a shift from the Academy to the A-team. How should the team appear, for Ralf Muhr to say, "I am satisfied"? My top priority is that the team has a positive and thoughtful passion - a passion with brain. This passion must be felt by fans, employees, media and club leaders. 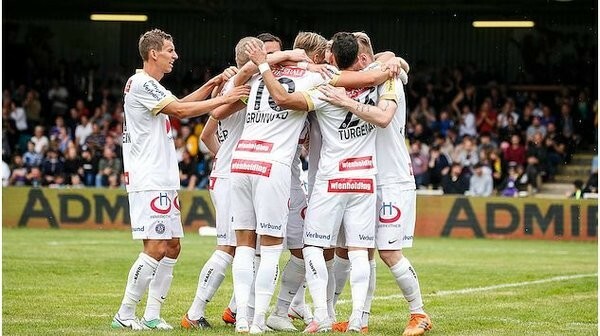 Equally important is a high intensity in our game - resulting in a victory for Austria Wien. 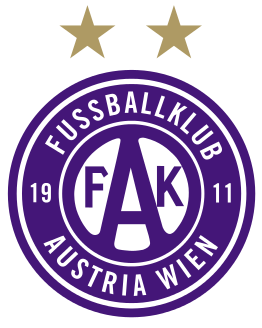 Austria Wien made radical changes to the squad during the summer. What is your interim conclusion regarding the summer transfer time? Our goal was to bring together a team that shows what we want to stand for: passion, mentality, the will to win, technical good football. I am convinced that we have the right types of players. It was also important to give the players, who have been with the club for a long time, the same kind of spirit. Is the squad for the new season complete yet? We’ve already had major changes, but we must continue to be vigilant as to whether we still need to react in one way or another. In my role, I will always look at the Young Violets and the Academy first, in order to see which positions we can re-occupy ourselves in the future. My focus as Technical Director is not only on this season, but on the next years. I think we have implemented our projects credibly and professionally so far. How do you rate the cooperation with head coach Christopher Steegmann and his coaching team so far? So far, the cooperation has been excellent, in my opinion. I see myself as a supporter and corrective in sports matters. I am in daily exchange with the entire coaching team around Christopher Steegmann, as well as with the rehab team and the team's management. From all sides I feel a very high work ethic and a high professionalism. You can feel that everyone wants to be successful. This Bundesliga season offers unique opportunities, most likely with one UEFA Champions League and two UEFA Europa League spots. What is the goal for this season? We want to attack. The big goal is, of course, to play in the Champions League in this stadium next season. We go into every game with the aspiration to win and to show our qualities on the pitch. What are your impressions of the first games in the new Generali Arena? I think you can now imagine what can happen here if our team is passionate. The stadium and the atmosphere here have left terrific impressions on me. The optics with the violet, which overlays the green, is simply outstanding and cool. As Technical Director you are also very much responsible for the consistency between the academy, the Young Violets and the A-team. What is significant for this? The young players must be able to feel that there is perspective for them in their own club and that there is continuity. Gassmann and Hahn from the Young Violets, who gained valuable experience in the training camp with the A-team, are good examples - or even the many Academy players who were on training camps with the Young Violets. However, the consistency also applies to sports science and scouting. The Young Violets are now playing in the second Bundesliga. What role will coach Andy Ogris' team play there? It is important that our perspective players have the ideal platform with the second Bundesliga, to show their potential and to develop further in order to be ready for the A-team as quickly as possible. I think the Young Violets can play a great role in the second Bundesliga. 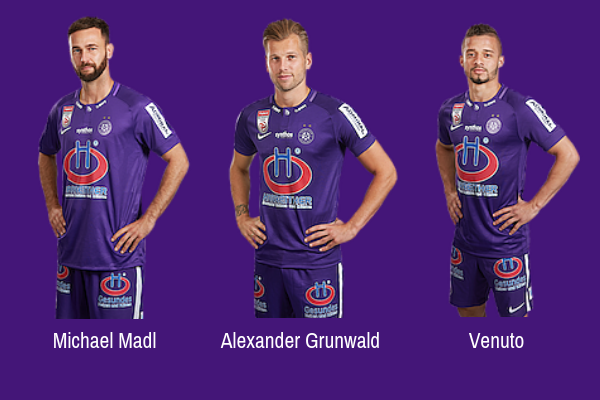 Fans can look forward to another Austria Wien team that will go to work with a lot of intensity and dynamism. What will be the focus of the sports area in the near future, apart from the two professional teams and the academy? We want to make the next steps of professionalization in the area of our rookies - above all in terms of trainer quality and infrastructure. ScottT: He should have quite a big role to play, he’s a good wing back and if he develops further could be key to the system I’m trying to implement! Justice: It is very useful, but I’ve never worked with this little money in a story before so it may not be as accessible a deal as it appears come the summer, but we shall see what the season has in store. Not having European football this season is a big blow but hopefully if we can qualify this year, we’ll have a bit more in the kitty to play with. Johno. : Thanks man, glad to have you on board for the ride! With the start of the new tipico Bundesliga campaign just over a week away, the 12 teams making up this year’s competition are finalising their preparations ahead of the new season. With OFB-Cup games to come over the coming weekend, the teams in the top flight of Austrian football will be hoping to kickstart their campaigns with a victory heading into the opening round of fixtures in the league. 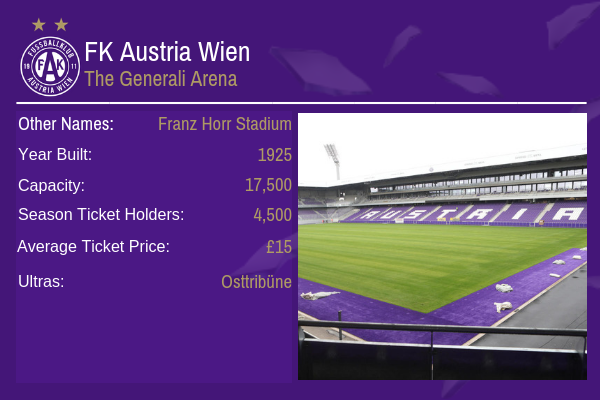 Here, bundesliga.at takes a look at one of the Bundesliga’s great clubs, Austria Wien. Since the appointment of Christopher Steegmann as the new manager at the Generali Arena, Austria Wien have played four friendlies, remaining unbeaten across the four games. Die Vielchen kickstarted their pre-season campaign with an impressive 3-0 victory over English side Wigan Athletic with an intense half an hour spell in the first half when Dominik Prokop and Venuto scored the goals. This was followed by comfortable 4-0 and 2-0 wins over Floridsdorfer and Kapfenberger. Defensively Austria were looking strong giving them a solid base to build forward on with their impressive attacking performances with the team setting a standard that La Liga opponents Villarreal were unable to handle for the majority of their meeting with Austria Wien as the two sides played out an entertaining 2-2 draw. The Spanish side needed a late equaliser to salvage a draw in the game, with Wien dominating the tie and looking very good going forward. In Christopher Steegmann, Austria Wien have followed a trend set by a number of clubs in the German Bundesliga, such as TSG 1899 Hoffenheim and SV Werder Bremen, by appointing young rookie coaches as the new men in charge. At 36 Steegmann is amongst the youngest managers in the league but his ideas on the training pitch have brought a big sense of unity around the Generali Arena. 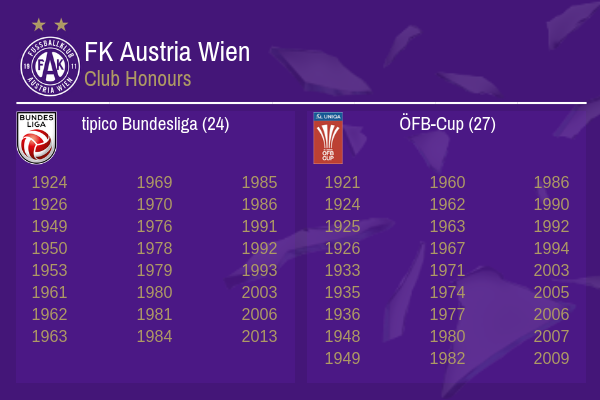 The 36 year olds sense of ambition and belonging have certainly impressed the Austria Wien players and the club is an optimistic one moving into the new season. 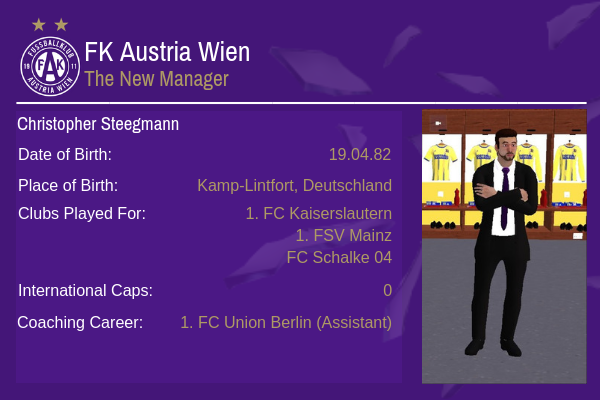 With a large playing squad to choose from, Christopher Steegmann will have no doubt identified the players he considers key to Austria Wien’s chances of success this season. Starting at the back Michael Madl, has proved to be a key figure during pre-season with his ability to bring the ball out from the back considered a pivotal part of Christopher Steegmann’s fledgling system at the Generali Arena. Alexander Grunwald has been a key player for the club ever since his debut and the Austrian will continue to pull the strings from the centre of the park, creating chances and although he failed to hit the back of the net during pre-season, Steegmann will be hoping he can weigh in with his fair share of goals over the course of the coming Bundesliga season. In the final third, Venuto will offer Steegmann the versatility he craves in his tactical system with the Brazilian able to play across the front line and cause damage to whoever the opposition are. From the limited amount of games Austria Wien have played since Christopher Steegmann was unveiled as the new manager, it seems that their style of play heading into the new campaign will rely heavily on pressing high in an attempt to win the ball back. 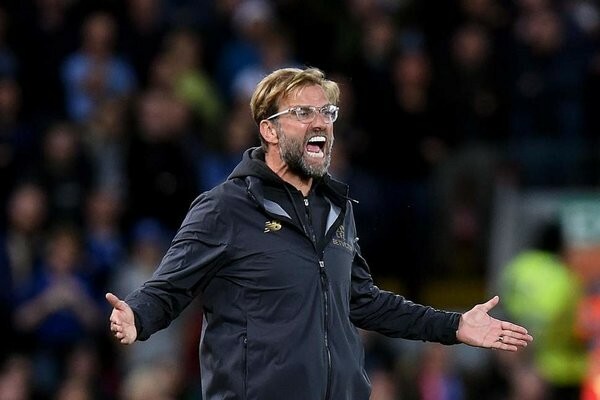 Through his work under Jens Keller at Union Berlin and through the clear inspiration of Liverpool boss Jurgen Klopp, Steegmann has attempted trying to turn Austria Wien into a team that utilises the latter’s famous gegenpressing. Austria Wien have attempted to with success in pre-season to try and win the ball back almost instantly after losing the ball and high up the pitch before trying to create chances quickly. Whether this will work in the Bundesliga against sides like Champions Salzburg or rivals Rapid Wien remains to be seen over the coming months. After a disappointing 7th place finish last season, Austria Wien missed out on European football altogether this season and it is there that Wien and Steegmann will set their sights this year. A return to Europe, most likely in the Europa League will be the target, with Steegmann saying he didn’t feel his side were quite ready to challenge for a first Bundesliga title since 2013. However, based on the evidence provided over pre-season Wien have looked like they are adapting to the German’s tactics quickly and a surprise run may be on the cards. As for the OFB-Cup, sights need to be set on going deep into the competition, potentially even targeting a win in the competition, although as for any team in cup football, a little luck will need to be on their side. 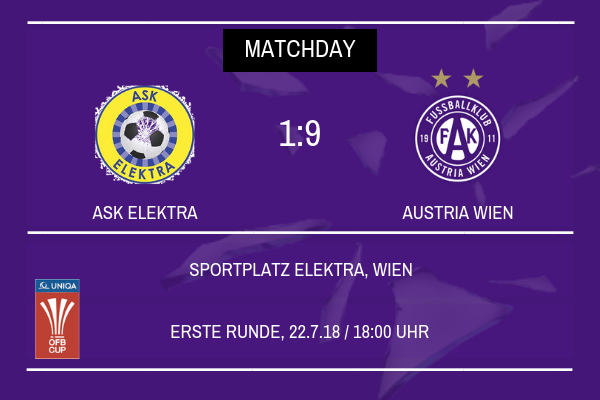 The Christopher Steegmann era at Austria Wien began with a bang tonight as his side eased to a 9-1 victory over semi-professional ASK Elektra in the first round of the OFB-Cup. The German manager selected a strong starting XI heading into his first competitive game in charge of Die Vielchen and it was a decision that paid off as the Bundesliga side didn’t need to ever get out of second gear as they blew their opponents away with a further showing that their managers tactical style is well suited to the current playing squad of the club. There is no doubting that tougher tests lie in wait for Christopher Steegmann and his team, not least on Friday when TSV Hartberg visit the Generali Arena for the opening game in the Bundesliga, and the visit to fierce rivals Rapid Wien on matchday 3 of the league campaign. However the German and the players can take great heart from their performance tonight as they played out Steegmann’s game plan with perfect execution. Austria Wien had 63% of the ball and completed almost double the amount of passes that their lower league opposition did whilst also having 22 shots on target, 9 of which did go in. The team were quick on the press, much to the visible delight of their new manager who will no doubt be buoyed and filled with confidence ahead of the league opener in less than a weeks time. Of particular delight, will be the goals that came from midfield for Austria tonight as captain Alexander Grunwald stepped up to score a magnificent hat trick with two of his three goals coming from sweetly struck efforts from outside the box. Uros Matic also bagged on his debut and Dominik Prokop scored twice as well. If, and it may be a big if, Austria Wien’s midfield can continue to contribute this effectively, and the forward line for the Violets can hit the ground running it could be a successful season for tonight’s visitors, who will of course, now have a second round tie to look forward too. There will be two slight areas of concern for Steegmann and his coaching staff though. The first being the inability to keep a clean sheet tonight as ASK Elektra scored a simple headed goal from a set piece, which will give Steegmann cause for concern, especially when his team come up against much sterner offensive tests in the coming months of the Bundesliga campaign, although it must be said that the German is little over a month into his tenure, giving the team plenty of time to iron out any creases. Venuto’s substitution due to injury will also have alarm bells ringing ahead of the visit of Hartberg, with the Brazilian having featured heavily for Wien under Steegmann and he will more than likely miss the opening game of the league campaign. However, it must be said that the positives definitely outweigh the negatives on an entertaining night for Austria Wien fans, who now have a second round draw and fixture to look forward to. The pressure was never on ASK Elektra though and Austria Wien more than delivered on a night where they couldn’t win in the eyes of many as a heavy win was expected but anything less would have been criticised and ridiculed. Only nine goals? Good start though, your team looks to be potent in attack! You are reading "Jagd auf den Red Bull". Handcrafted in Symi, Hellas. Page created in 0.255 seconds.